Finding the best interchangeable knitting needles for beginners can be hard to do. This article will help you know what to look for in a great beginner’s needle! Whether you’ve just started knitting recently or are a proud knitting addict, at some point you’ll want to take your knitting to the next level. Maybe you’ve heard a lot about interchangeable knitting needles and are curious about the chatter. Do these needles deliver on their claims? In this article, we’ll answer that question and share our picks for the best interchangeable knitting needles for beginners. Do you really need to buy an interchangeable needle when you first start knitting? Interchangeable knitting needles are circular needles that allow you to separate the cords from the needle tip. You can change or combine cords to create a variety of needle lengths, and you can switch needle tips for larger or smaller needle sizes. Why Use Interchangeable Knitting Needles? Interchangeable needles allow you to create circular needles of whatever length or size you want! If you’re in the middle of a project and suddenly realize that the cord length is too big or too small, you can easily use a connector to combine two cords to create a longer one, or you can attach the tips to a shorter cord and keep knitting without searching for (or buying) another needle. If you’re knitting and discover you need a different needle size, you can easily swap out the tips you’re using with smaller or larger tips – you can change your gauge without taking your fabric off the needle! If your collection of needles is taking over your house or apartment, you can use interchangeable knitting needles to consolidate your needles and have more space to store yarn. If you’re constantly sorting through piles of circular needles to find the size and length you’re looking for, and coming up short, you should use interchangeable knitting needles. You can mix and match needle tips and cords to create the right size of needle you need. When you shop around for the best interchangeable knitting needles for beginners, you’ll find that the highest rated brands have similar features. Each feature has a purpose. Here are a few things to look for when choosing interchangeable knitting needles. Most cords are made from plastic, but some manufacturers use plastic coated steel. Needle tips can be made from wood, aluminum, stainless steel, and brass. If you’re allergic to nickel, check the tips carefully as some are nickel-coated. The joins are where the cords attach to the tips. A smooth join is best as it prevents yarn from snagging as you knit. 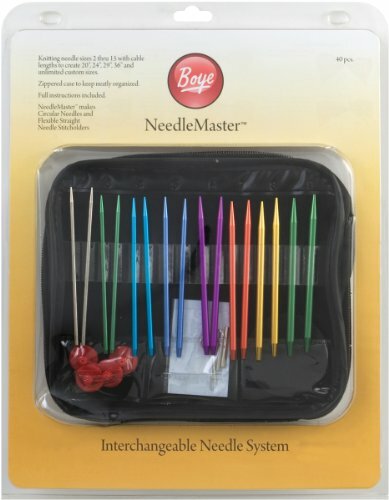 With interchangeable knitting needles, you are able to create a variety of needle lengths. The length of the needle will depend on the cord and the tips. Interchangeable knitting needles are measured just like fixed circular knitting needles – tip to tip, with cord included. That means the length of both needles and the cord connecting them are combined to give you the total measurement (or length) or the needle. The length of the cords and the tips vary by manufacturer, but the standard lengths range from 16” to 40”. Needle tips typically come in 2 standard lengths: 4” and 5”. The 4” tips are often called short tips, while the 5” tips are known as long tips. Interchangeable knitting needles work by first attaching the needle to the cord. Different brands have different methods of attachment – some screw together, some require a special key to screw the pieces together, and others “click” together with no screwing required. When knitting, interchangeable needles are used like any other circular needles. When you’re knitting in the round, interchangeable needles work by joining your project and knitting every row as if it were a right side row. This means that if you’re knitting stockinette, you knit every row, but if you’re knitting garter stitch, you alternate your knits and purls. When you’re reading a charted pattern, every row is read from right-to-lift. When you’re knitting flat, use interchangeable circular needles like straight needles. You knit back-and-forth, turning your row to the right/wrong side at the end of each row. We’ve picked out five of the top interchangeable knitting needles that are suitable for beginners, and highlighted their features, advantages and disadvantages, to help you make an informed decision. Knitters find these needles to be easy to use, even for beginners. The smooth joins prevent yarn from snagging. The stainless steel needles allow for faster knitting, but also hold onto yarn just enough to prevent stitches from dropping easily. Most people find that these interchangeable needles work well for all types of knitting. Offering a wider range of sizes than other brands, these needles can be used with almost all yarn weights – lace to bulky. 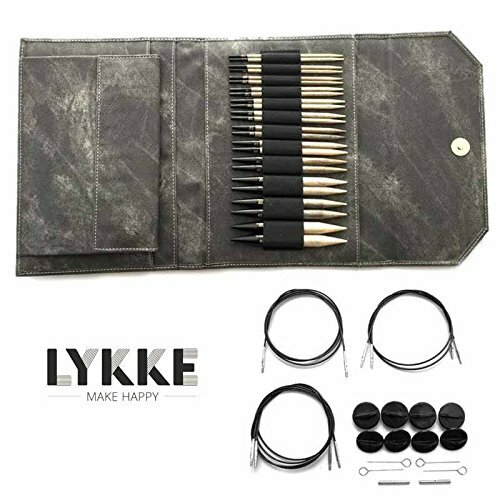 This set also comes with the tools needed for all projects – knitter’s safety pins, darning needles, snips, and stoppers – making it more economical than other brands. As can be expected from wooden needles, these needles grab slippery yarn, giving them the ideal amount of stickiness for beginners. The warming qualities of the wood are appreciated by anyone who finds their hands getting tired and achy from long hours of knitting. However, some knitters find the cables too dark to count stitches easily, while others think the cables are a little too stiff for the magic loop method. But the vast majority of people enjoy these interchangeable knitting needles, and think the price is justified. 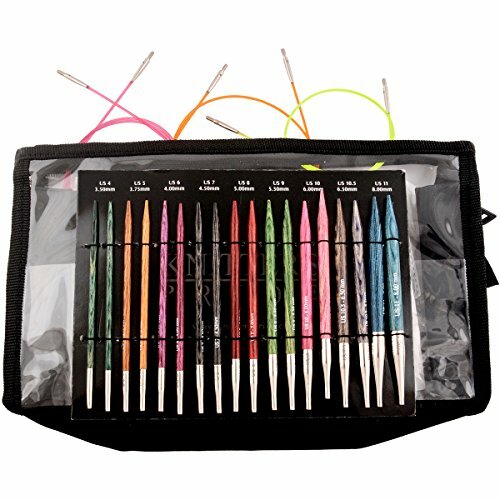 These interchangeable knitting needles are extremely popular with knitters who want a lightweight, color coded needle. The aluminum needles allow stitches to glide easily while providing just enough stick to help prevent dropped stitches. Knitters recommend tightening the joins whenever you pick-up your knitting to help prevent them from coming unscrewed while you work. Some knitters find the cable is too stiff for the magic loop, but most people agree that he price makes it a great entry point for beginners who want the convenience of an interchangeable needle without breaking the bank. Known under the brand name, Knit Pro, outside of the US, these interchangeable needles have been used by knitters around the world for years. Popular among beginners, these wooden needles allow stitches to slide easily, but not too fast – making it less likely that stitches will be dropped. Unlike other brands, cord connectors must be purchased separately. While many people feel that the price offsets the need for additional purchases, others are disappointed to find they have to purchase additional parts for projects. 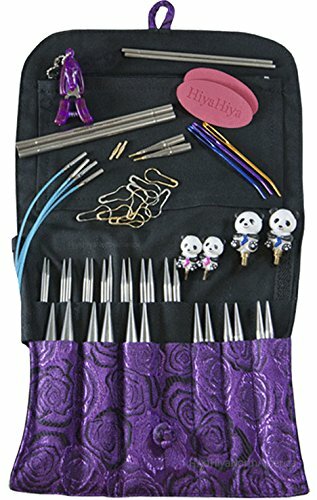 The clear winner for the top interchangeable knitting needle for beginners is the Hiya Hiya Interchangeable Knitting Needles set. This set contains many of the common tools all knitters use – knitter’s safety pins, darning needles, snips, and stoppers. You won’t find yourself in the middle of a project without the tools you need to finish it. This needle set has the benefits of swivel cables, a lifeline hole, and 13 tip sizes allowing beginners to work with a wide variety of yarns – from lace to bulky. With just enough grab to keep stitches from dropping easily, while still allowing stitches to slide quickly, we agree with the majority of knitters that these are the best interchangeable knitting needles for beginners.